Experiment with several contemporary natural dye materials and techniques in one class, to make unusual and exciting botanically printed silks with Babs Behan. An opportunity to experiment with a range of exciting mediums, including dyes, inks, powder pigments and fresh plant materials, including flowers, leaves and berries. Learn how to use a range of techniques, including bundle dyeing, Shibori tie-dye and mark-making with inks. These techniques will be used together in class to create some unusual natural dye results! 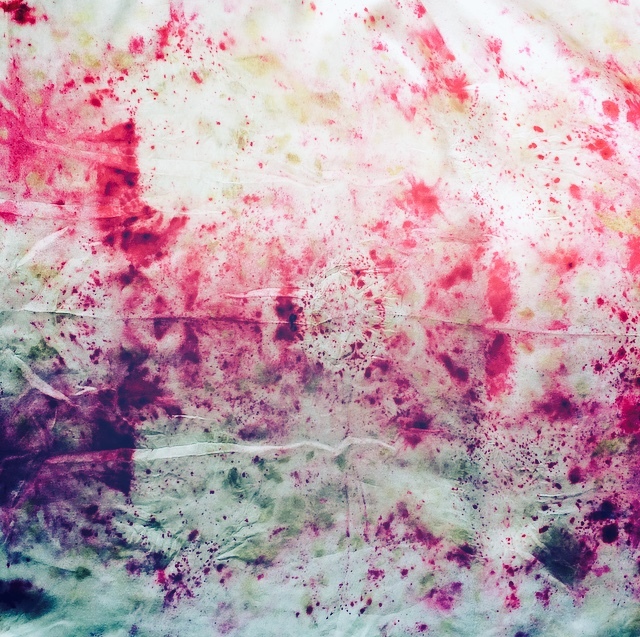 Use Japanese Shibori tie-dyeing to create resist patterns using simple folding and binding techniques, paint and inject botanocal inks into folds of cloth, scatter fresh and dried flower petals into bundles for steaming to release their colour and create direct impressions on cloth. And learn about the joy of using natural materials to create exciting prints and colour on fabrics. All materials are provided and included in the class, as well as a length of pre-mordanted organic British silk. There will be more silk available to buy at an additional cost, at £28 per metre, also available by the 1/2 metre.